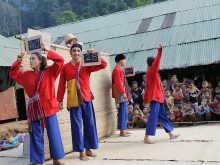 A team of 7 French artists performed 23 shows for 3 580 Burmese refugee children in Thailand. 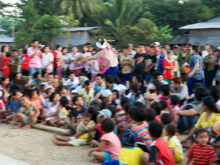 In 2012, Clowns Without Borders Belgium visited the Burmese and Karen refugees in Thailand. They performed 70 shows for 21000 people. In 2011, Clowns Without Borders France returned to their long-lasting project in Thailand aimed at relieving the sufferings of the Burmese and Karen refugees. They performed 25 shows for 15,000 people. 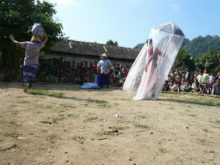 In 2010 , Clowns Without Borders Belgium went to Thailand in the Burmese and Karen refugee camps. They performed 15 shows for 6000 people. 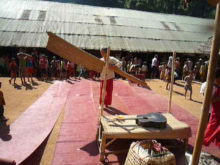 In 2010, Clowns Without Borders France went to Thailand to tour the 9 Burmese and Karen refugee camps. They performed 24 shows in total for 20000 people. In 2009, Clowns Without Borders France went to Thailand to bring joy to the people living in Burmese and Karen refugee camps. They stayed for 3 weeks and performed 16 shows for 9000 people. 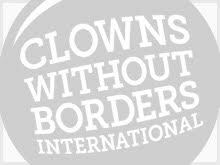 In 2008, Clowns Without Borders Belgium went to Thailand to support the Burmese and Karen Refugees. They performed 30 shows for 10,000 people. 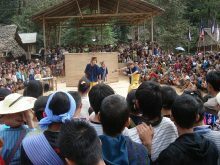 In 2008, Clowns Without Borders Belgium toured in Thailand, Laos, and Cambodia to perform 30 shows for 6000 people. In 2008, Clowns Without Borders France returned to Thailand to bring joy to the Burmese and Karen Refugees. They performed 26 shows in refugee camps, schools and clinics, for 22,220 people in total.